Football season is back! Let the game day parties commence! This recipe from Eat Sip Trip pulls together the holy trinity of football flavor: spicy, salty and an unholy amount of cheese. Calories don’t count on game day. 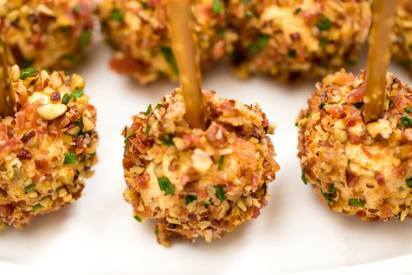 These spicy mini bacon cheese balls are a triple threat guaranteed to satisfy all your party guests’ cravings, with all the flavors and spice of jalapeño poppers dialed up a notch with the addition of Bacon and toasted pecans for a salty crunch. A pretzel in each ball makes a lollipop-like snack that’s as fun to make as it is to eat. They’re worth letting your diet slide. Scroll through the photos below for step-by-step directions on how to make these spicy mini bacon cheese balls.